President Obama, our leader, has bad taste. Not in policies, women or baseball teams, perhaps. But when it comes to food and drink, even the most devoted Obama follower needs to not order what he's having. 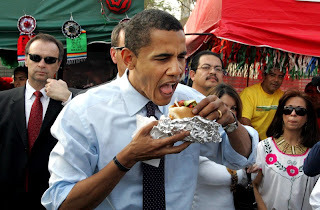 I don't think Obama's actually a non-taster by the standards established by University of Florida professor Linda Bartoshuk (herself a non-taster). If he was, I don't think he'd prefer dijon mustard on his burger. * With the entire world twittering about his choice of beer, Obama picked a Bud Light, a product so tasteless that it's advertised not as delicious, but merely drinkable. * Obama's favorite wine is also America's favorite super-premium wine: Kendall-Jackson Vintners' Reserve Chardonnay. Not to say that America has bad taste, but ... well, this is the country that prefers Doritos and Transformers II. I had K-J Vintners' Reserve last week for the first time in a while, and had forgotten that it's sweeter than sweet tea. But Obama likes it. * Obama brags about his chili recipe; it's the one food he talks about making. But the recipe is lame. He uses a can of tasteless red kidney beans instead of more flavorful legumes. He lists it as "either turkey or beef," as if there's no difference. Turkey chili? That's for non-tasters. The spice comes from 1 tablespoon of chili powder; there's no jalapenos, cayenne pepper or even black pepper. It's boring chili for somebody with limited time and care. * On the campaign trail, the guy lived on Met-Rx chocolate and roasted peanut protein bars: Sweet and salty enough to reach even the most dull tastebud. He also loves Planters Trail Mix. * Michelle Obama regularly ordered thin-crust pizza in Chicago, but Barack Obama prefers deep-dish, even calling one St. Louis version the best pizza he'd ever had. Sorry folks, deep dish pizza is a platter of ballast. If you want to taste rather than consume, you get thin crust. * Obama is well-known for staying healthy by eating a lot of vegetables. I'm glad he's healthy -- I want him in good shape to run the country -- but I have to point out that non-tasters also eat a lot of green vegetables because they don't taste the bitterness. In fact, I suspect a majority of vegans are non-tasters, and why not? If you taste in pastels instead of neon, why wouldn't you eat the healthiest diet possible? * Obama wisely lets Michelle choose restaurants for their now-more-rare public dates. No wonder -- I heard from a former employee of Spiaggia, the upscale Chicago restaurant often listed as the Obamas' favorite splurge, that Michelle was the serious foodie, sometimes ordering wine off the list in advance from home so it could be decanted, and often ordering dinner for both of them. This proves Barack's self-awareness and willingness to delegate, which are good things. But think about it: if Barack Obama could pick a good restaurant, wouldn't Michelle occasionally let him choose? * I read all of "Dreams From My Father," and one of the things I liked best about Obama is his "exotic" background -- childhood in Indonesia, teen years in Hawaii. Does he miss sambal oelek? Does he reminisce about gado-gado and nasi goreng? No. While at Harvard, did he miss kalua pig? No. Obama had the opportunity to grow up with a palate as sophisticated as his politics, but instead he eats protein bars. All of that said, I wonder who has the best palate among American politicians. Political events all have cheaply catered meals and bland menus because nobody wants Rush Limbaugh talking for a week about wilted arugula. And it's hard to become governor of California, let alone President, if you spend too much time thinking about lunch. Gavin Newsom, former wine shop proprietor, may learn this next year. If not, he might become America's highest-placed gastronom. If there is a consequence to Obama's lack of taste, it's in his relatively small interest in giving us real change in farm bill policy. Though I'm sure he understands the environmental issues, if he can't taste the difference between organic celery and the standard supermarket version, he'll never be quite as motivated. I didn't write this post to bemoan the man, though. I still think he's likely to be the best and most important President of my lifetime. I'd love to meet him in person. But if so, I'm going to take a tip from Prof. Gates and Sgt. Crowley and order my own drink.